The US dollar has been on the rise every day setting new records. With the upward pressure on dollar, stronger dollar could tighten financial conditions across the globe. Further the rising dollar could be offsetting the benefit of low cost oil within the US economy. Over the past six months, the trade-weighted dollar has risen 25% and faster than anytime the last 40 years. US dollar is a global unit of account in debt contracts and that could be a cause of slow down in the rest of the world. Not only that, if the dollar continues to increase, inflation and US economic could weaken. Federal Reserve this week is much in news as it began its latest two-day policy meeting. Many feel that Fed could raise interest rates substantially faster than expected though but this might not happen anytime soon. Others bet on a June rate hike this year. According to Neil Irwin, anticipation of the Fed meeting (which started Tuesday), where officials are expected to signal interest rate increases could be near, has driven the dollar even higher in the last couple of weeks. For US consumers, a strong dollar could be good news as they have more purchasing power in the global market place especially in Europe. Imports could get cheaper and put a downward pressure on prices. At the same time for companies that have foreign sales and revenues, this might not be good news. Since they get most of their profits in foreign currencies, a rising dollar could lower their profits. Exports may get expensive for foreign countries and this could decrease the demand for American workers and put an upward pressure on their wages. Euro seems to be under pressure ever since the European Central Bank (ECB) started its €1.1 trillion asset buying program on March 9. ECB plans to print €60 billion per month to buy debt until inflation hits the target rate of 2 percent. A weaker Euro will be making exports more attractive. 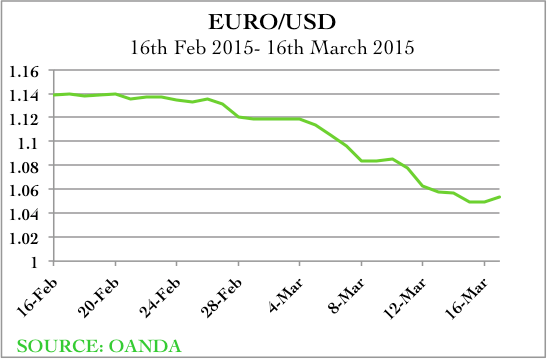 Rising Dollar and Euro Parity? Incase of an interest rate hike in June, US bonds will become more attractive. In such a case, investors shifting from Europe will likely turn to the US. Investors and corporate treasurers could become increasingly confident and aggressive in borrowing euros to convert into dollars and take advantage of higher US rates. Many economists feel a fluctuating currency could cause more instability and uncertainty and create situations like Japan has faced for the past two decades. But the affect of a weak Euro will be different across the 19-member Eurozone. Germany, for example, has benefited from both the drop in bond yields and the weaker euro. But similar might not hold true for an uncompetitive relatively smaller country like Greece that needs economic growth the most to tackle its debt problem. The benefit probably may come to those countries, which might need it the least like France and Germany. According to IMF, emerging markets may face economic instability when US interest rise this year. The IMF chief, Christine Lagarde fears a negative ‘spillover’ from such increases incase of economies such as India and Turkey. Dollars have been flowing into emerging markets for a while now. Corporations and governments of developing countries have borrowed dollars and the amount they owe now is increasing with every cent increase in value of US dollar. According to Bank of International Settlements, in mid-2014, non-bank borrowers in emerging markets owed $5.7trillion. This includes $1.1 trillion of dollar debt in China itself, more than double its amount at the end of 2012. But economists argue that states’ reserves could take care of the emerging market dollar debt since it is mostly corporate and not sovereign. China, India, Russia have eased the monetary policies. The BRICS in general, especially since the crisis of 2008, have been trying to break free from the dollar’s dominance. 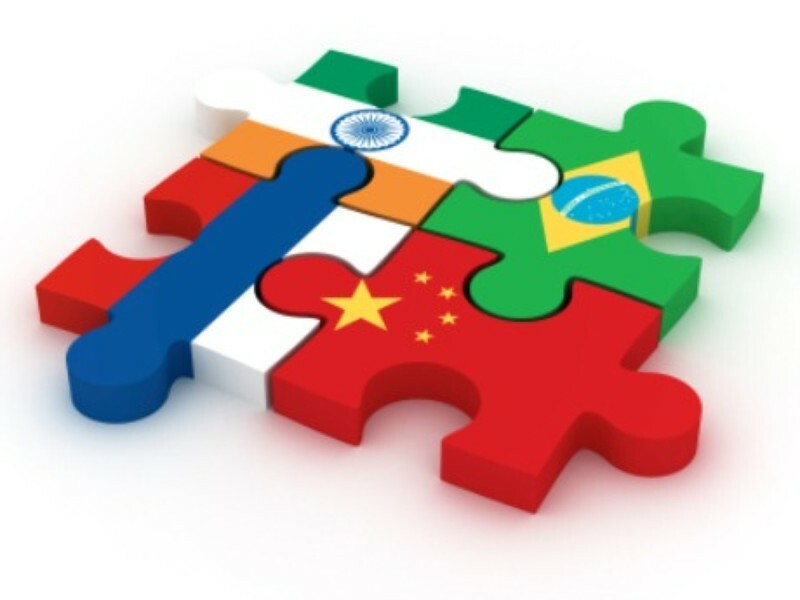 The BRICS New Development Bank, formally created in July 2014, is intended as an alternative to the IMF and World Bank. But rising dollar news puts BRICS in an awkward position since US dollar is affecting emerging markets too. Companies that are big exporters will get their revenues in US dollars. But the benefits depend on the value of their debt obligations. According to Neil Irwin, private companies, not governments, have incurred debt in a currency not their own. So if companies have borrowed aggressively in other currencies, repayment could get expensive. This could lead to bankruptcies, lay offs and cost cutting that could affect the economy and lead to a financial collapse. Brazil and South Africa have been especially hard hit. Debts in Brazilian Real seem to be getting more and more expensive each day with dollar on the rise. China is the largest holder of US debt and a slowdown in China’s economy might not receive the rising dollar as good news. Currently according to US Treasure Department, 2015 Brazil & India accounts for 4.13% and 1.47% of US Debt whereas China accounts for 22.69%. As for Russia, things seem to be improving even though they are not very strong. The Bank of Russia has been considering stopping currency trading to stabilize the ruble. Bank of Japan expanded its own “quantitative easing” project and Japan’s exports have been on the rise since February. The increase in exports is mostly due to strength in US dollar and cheaper oil. Reviving exports was an important part of ‘Abenomics’, an economic revival agenda initiated by Prime Minister Shinzo Abe. The belief was that it would stimulate production, create jobs and increase wages. A strong dollar is good news for Japan. On Tuesday, Bank of Japan kept its monetary policy unchanged indicating that prices could fall in coming times. The worry however in Japan could be the debt portion. The Japanese government is one of the largest debtors in the world and that’s not news to anyone now. With the country being in economic turmoil for decades, the US dollar is achieving strength against the yen at a level not seen since 2007. Its gross public debt is already 240% of its GDP. It is as close to China in being the largest foreign holder of US Treasuries.